'Aristotle' dishes out advice on the virtues and duties of the king. Here the subject is justice and how to mete it out wisely throughout the nation. 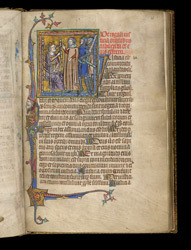 The picture shows Aristotle between the king and two noblemen, the ruler giving wise council based on the advice of the 'Secrets'. The partial border is enlivened with an imaginary creature lurking among its ornament.